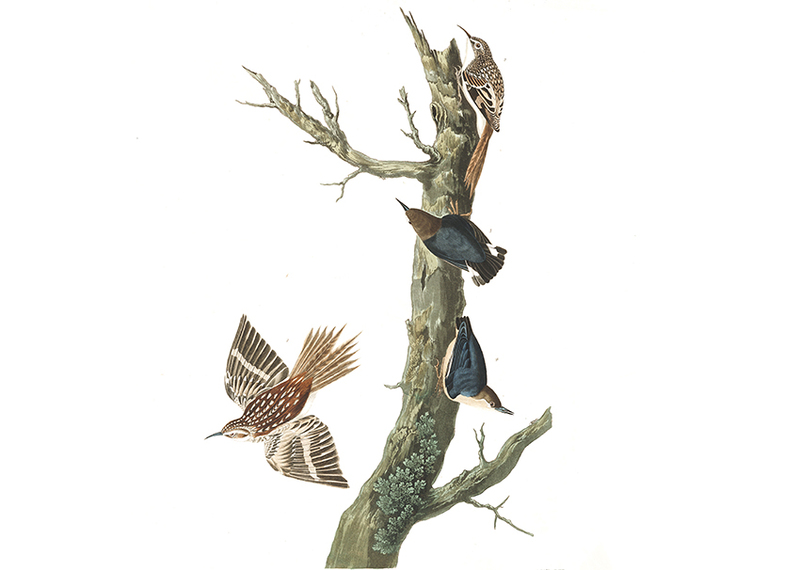 Brown Creeper, Certhia familiaris [male, lower left; female, top], and California Nuthatch, Sitta pygmea [properly, pygmaea; center two]. Plate 415 from The Birds of America. Watercolor by John James Audubon. Engraved, printed, and colored by Rob Havell, 1838. Image courtesy of the National Audubon Society website. John and Ursula Burroughs married in 1857 and, although they remained together for sixty years, the relationship was, at best, strained. Early in their marriage, John’s close friend and mentor Walt Whitman wrote angrily to him, “Your casual, selfish wantonness hurts Sulie more than she deserves to be hurt. The urges of your biology spark the one great and only flaw in your otherwise generous and noble character.” For two decades Whitman often comforted Ursula Burroughs and provided companionship when her husband was away from home. By the time Whitman died in 1892, John and Ursula’s marriage had more or less reached a state of detente. Although Whitman had clearly taken sides in the relationship, Burroughs remained a devoted disciple. “I am convinced Walt is as great as Emerson,” he wrote, “though after a different type. Walt has all types of men in him, there is not one left out.” In fact, the first of Burroughs’s thirty-plus books was also the first-ever study of Whitman’s poetry. Published in 1867, Notes on Walt Whitman was, in the words of one source, “so extensively revised and rewritten by Whitman himself that it should properly be considered a collaborative effort.” During the four years following Whitman’s death, Burroughs wrote at least eighteen appreciative essays for various periodicals, culminating in a second book-length treatise on the great poet. After coming down a gentle grade, at a turn, for some unaccountable reason, I must have steered to the left. In a twinkling the car ran into a bank, tried to climb it, and overturned upon us. J. B. was completely hidden beneath the car. The upper part of my body was out, but one leg was pinned fast. A workman passing came to the rescue. When I told him to run for help—that Mr. Burroughs was under the car,—he cried, ‘Oh, my God!’ ran, and was soon back with others who lifted the car. She also reported that, while Burroughs was recuperating, he came up with the “title for his new book—Field and Study—“and occupies himself watching the birds and reading and writing.” And one of the most well-known pieces in the book, “Nature Near Home,” describes the joy of staying at home and watching birds during winter. Forty years earlier he had written, “Little dramas and tragedies and comedies, little characteristic scenes, are always being enacted in the lives of the birds, if our eyes are sharp enough to see them.” One imagines Burroughs, with eighty years of drama and tragedy and comedy behind him, recuperating from the most recent excitement and taking pleasure instead from the stage Nature had set before him. After long experience I am convinced that the best place to study nature is at one’s own home,—on the farm, in the mountains, on the plains, by the sea,—no matter where that may be. . . . If you don't see the full selection below, click here (PDF) or click here (Google Docs) to read it—free! I challenge anyone not to be charmed.